Ticks every box. The winning restaurant does not need to receive three hats, but must capture the mood of the city right now and exemplify what it means to be a world-class restaurant. The buzz for this ultra-trad Japanese restaurant hasn't let up since the doors swung open back in January. What's prompted the restaurant's extraordinary word of mouth is Koichi Minamishima's single-minded pursuit of sushi excellence, the like of which Melbourne has rarely seen. The serene, softly lit dining room of pale timber and rough, dark rock is arresting, and the skilful, nuanced service enhances the experience whether you're a neophyte or a seasoned traveller. The most exciting opening in the past 12 months, this restaurant sets the eating agenda and starts conversations. Represents everything that's fresh, hot and interesting about eating. The service is tight, the pasta is silken and the offal is the kind even haters can't hate. What's not to love about Andreas Papadakis and Luke Skidmore's humble pasta bar in the heart of the city? Nothing. No other venue in Melbourne has garnered such a cult following in the last year. Tipo 00 is the pure essence of everything we love about Italian dining culture distilled and poured into a minimalist venue that feels as young and spry as it does entirely grounded. Singularly focused venues have ruled the year, and we're crowning Tipo king. Chefs scatter around words like "local" and "seasonal" like so much puffed ancient grain. But Dan Hunter is living it at Birregurra, where much of what appears at the table is drawn from the surrounding land. With fierce focus on technique, precision and flavour, he captures the terroir of Victoria's western district in a series of carefully calibrated courses. The best beyond metro limits. The winning vestablishment must provide a restaurant experience comparable to anything in the heart of the city but still remain uniquely regional. Visitors from Melbourne, interstate and around the world crunch up the gravel drive to the low-slung farmhouse on the brow of a hill. The room is an elegant study in timber and linen, with large windows taking in gardens that produce many of the vegetables that end up on the plate. Dan Hunter's food – botanical, textural and generally sensational – has put the tiny township of Birregurra on the map. This award is chosen by a panel made up of industry veterans Alla Wolf-Tasker, Andrew McConnell and Philippe Mouchel. It is the ultimate accolade for a committed and talented young cook likely to be a future leader in the hospitality industry. Now travelling in Europe, George Tomlin (until recently the sous chef at the Town Mouse in Carlton) impressed the judges with his ability to hold his own in culinary terms. Already showing signs of a distinct and personal style, Tomlin also brings to the table an appreciation for the strong leadership needed to build a team capable of providing consistency and above all the need to continue to develop his own skills and knowledge. A new award that celebrates innovation, charity and sustainability. The winner of this award will have gone above and beyond to contribute to the broader community. We often describe the best service as "intuitive", implying the skills are innate. Natural charm helps, but expert knowledge that can stand up to interrogation and the ability to read a room? Those are learned skills. This year, our master is Randolph Cheung, the man responsible for much of the calm and beauty of dining at Minamishima, and all of the phenomenal sake and wine matches. The seamless experience is testament to a long career floating the floors of Flower Drum, Asiana, Azalea and the Atlantic, and the cellar is living, breathing evidence of the relationships Cheung has built over the years. Since taking over a 1928 bathing house on the St Kilda foreshore, Gail and Kevin Donovan have trained a small army in their particular brand of likeable, polished hospitality, and fed an even larger one their likeable, polished comfort food. But in January 2015, rather than celebrating the restaurant's 20-year milestone, the pair were deep in renovations after last year's fire. The work has left the restaurant ready for its next 100 years and the industry veterans more determined than ever. "It's our life," says Gail. "We're loving every minute of it." The best all-round bar that ticks all the boxes: service, drinks, vibe and decor. The winning bar adds something new or different to the drinking scene. This Crossley Street cocktail powerhouse has been the dark horse of the year – until now. It's all in the details, from the rows of cut-glass decanters that glitter against every dark wooden panel to the most perfectly crafted Trinidad sour you're likely to find in the city. The beers and wines are just as well chosen – even the bar nuts are salted almonds, served in a little glass box and wreathed in smoke. Good times and Billie Holiday guaranteed – oh, and it's open both early (3pm) and late, for your drinking pleasure. Celebrating the memory of an influential Melbourne restaurateur, this award honours the unbeatable combination of restaurant-quality food in a bar setting. Nothing says drinking food like eggs on eggs – the eternal genius of golden fish roe dressing a devilled egg. And nothing screams "Hey! You're eating in the South!" quite like hummus formed of boiled peanuts. But that's Bar Clarine – the subtler, sweeter sister to Nashville hot chicken and natural wine bar Belle's. Young sommelier George McCullough will push your natural wine buttons, and the likes of corn cakes and pimiento cheese, and oysters dressed with cucumber, bay oil and white pepper redefine contemporary bar snacking without making a big deal of it. This is food built for wine, built for fun and built for now. The successful wine professional will be able to demonstrate an in-depth knowledge of their subject while helping to influence and educate diners. They must be personable, inclusive, curious and driven to constantly deliver the highest level of service. We've been tracking sommelier Meira Harel on her steady upward trajectory from the wine-worshipping floors of Grossi Florentino, to Brooks, and now to the head sommelier position at the Lake House in Daylesford. She's injected the venue with her patent enthusiasm for frontier, low-intervention grape juice while championing some of the excellent unsung heroes of the region. She delves the nerdiest depths to curate a great list, but delivers drinkers only the rewards. That Woodland House enjoyed a head start by inheriting some wines from its predecessor, Jacques Reymond, is clear from one look at its worldly wise wine list. That it has built on that depth by seeking out edgy young producers, biodynamic and organic makers and looking to roads less travelled has imprinted the list with its own identity. A strong, multinational collection of wines by the glass, a rounded approach to Old and New World wines and multiple vintages of classic stars completes a fine list. This award is for a wine list outside Melbourne. The winning wine list will offer a diverse and high-quality by-the-glass selection alongside an accessible bottle list that displays a good range of vintages and complements the restaurant's food and style. Ostensibly, this weighty leather-bound list is about showcasing the wines of Ten Minutes by Tractor. But it goes so much further. Laid out before diners is an extensive overview of the styles and makers of the Mornington Peninsula, with the entire repertoire from delicious pinot noir and chardonnay through to new stars pinot gris, friulano and more on display. And that's not all: multiple vintages, older vintages back to 2005- 06 and fair prices, too. Here, peninsula wine quality and diversity shines. A new award celebrating our diverse and exciting cheap dining scene. It's all about great food at an accessible price point, no matter what the setting, from shopfront to cafe to kebab stand. Katherine Place is a far cry from the streets of Delhi, but it's as close as you'll come in downtown Melbourne. This family-run diner is made vibrant with Indian movie posters and the boldly flavoured street food exiting the open kitchen. Come for the great-value thalis, snackish pani puri, and fusion dishes like Indian nachos, burritos and naan-based pizzas. 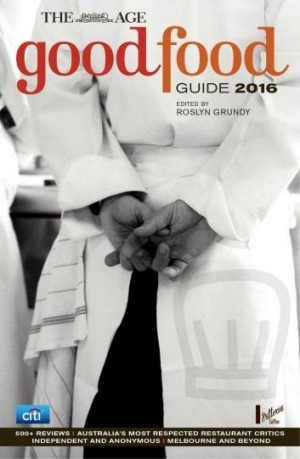 A new addition to the Good Food Guide, this reader-driven award allows the public to name their favourite restaurant. Voted by the people, for the people. The tribe has spoken. The inaugural People's Choice winner, as voted by readers, is Red Spice Road. The two huge CBD restaurants send out dishes from all over Asia, including the signature chilli caramel pork belly, which has its own fan club.